Unlike Montreal’s busy city pace where we were compelled to keep up with the energy the city was exuding – the opposite was true for Ottawa. 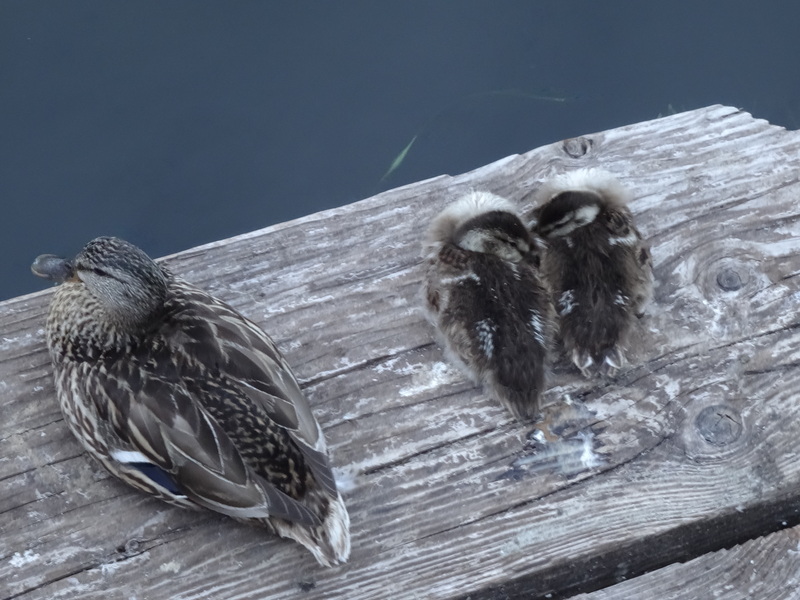 Ottawa’s easy pace and laid-back feel seemed to give us permission to slow down and rest. I very much welcomed this and think it is probably why Ottawa was my favorite of the three eastern Canadian cities we visited. The duplex we rented was half of a beautiful Victorian house in the Hintonburg/Wellington Village neighborhood just west of downtown Ottawa, and a short walk to markets and loads of restaurants on Wellington Street. It also provided us with easy access to the Ottawa River Parkway – a bicycle path that follows the southern bank of the river. It was a quick, safe and scenic route to downtown and Parliament Hill. Ottawa is Canada’s government center – it is the Washington, D.C. of Canada, and Parliament Hill is the city’s regal focal point. 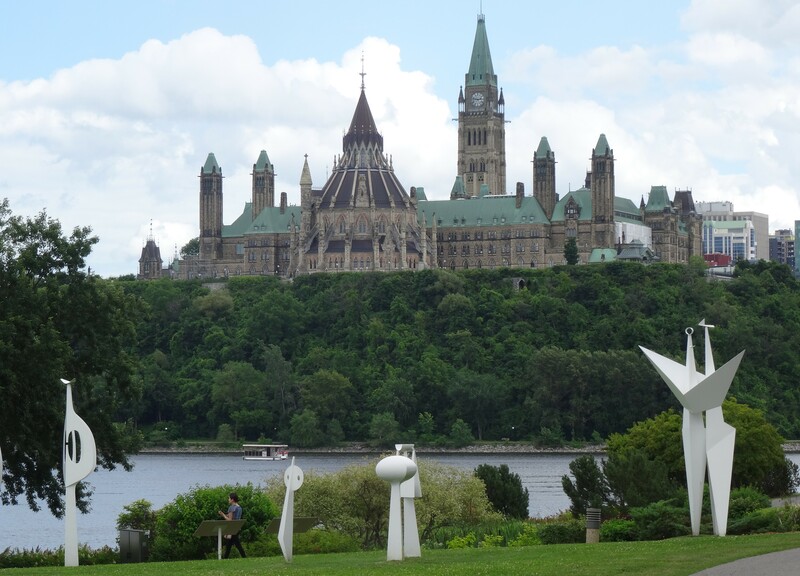 Four gothic revival buildings, complete with gargoyles and grotesques, sit on the Ottawa River surrounded by beautiful grounds. We strolled through the grounds stopping at various statues and monuments honoring Canada’s history. 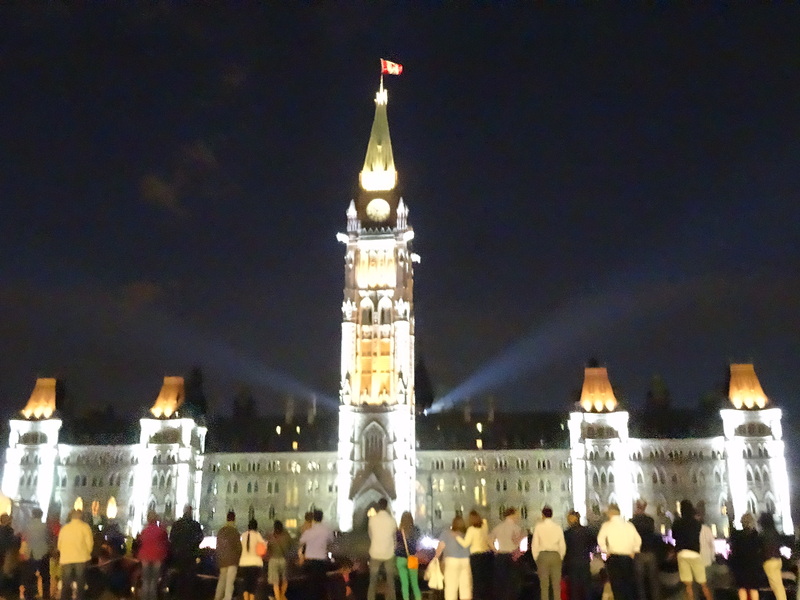 We also enjoyed Parliament Hill in the evening after learning of a sound and light show that takes place nightly during summer months. We joined hundreds of others for an amazing light show. The main parliament building seemed to come alive through projected images. It danced in sync with a mix of orchestra and techno music that was blasting out of a wall of speakers and amplifiers set up on the vast lawn. At one point the building’s windows appeared to stick out into another dimension apart from the rest of the building – then another window would pop out while the other would move back into place – and then more and more would pop in and out as if the windows were trumpet keys blowing out the beat of the music. It was magical! The light show then went on to tell Canada’s history through large mural-like images projected onto the entire central building. Scenes included the stories of the “First Nation,” French explorers, fighting back invading Americans during the War of 1812, and Canada’s alliance with the U.S. in current conflicts. The show culminated with even larger images of Canadian icons blasting rapidly to the beat of music. 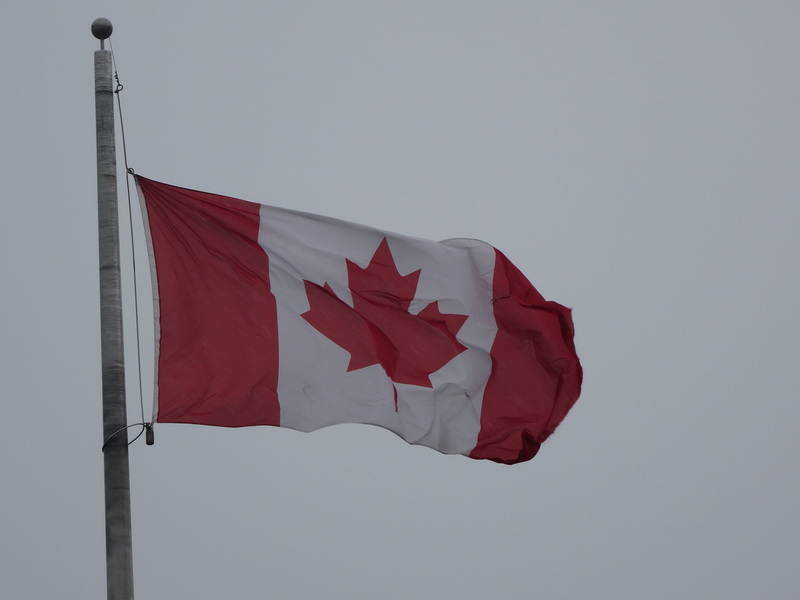 This finale was followed by an explosion of applause and Canadian pride – even from us Texans! Three months later we would hear of the terrorist attack and shooting death of a Canadian soldier at one the monuments we had visited. We hope that the violence and fear of the lone zealot has not affected Parliament Hill, as our memories of visiting this area are of a peaceful, diverse, welcoming and safe environment. We would gladly return without hesitation. 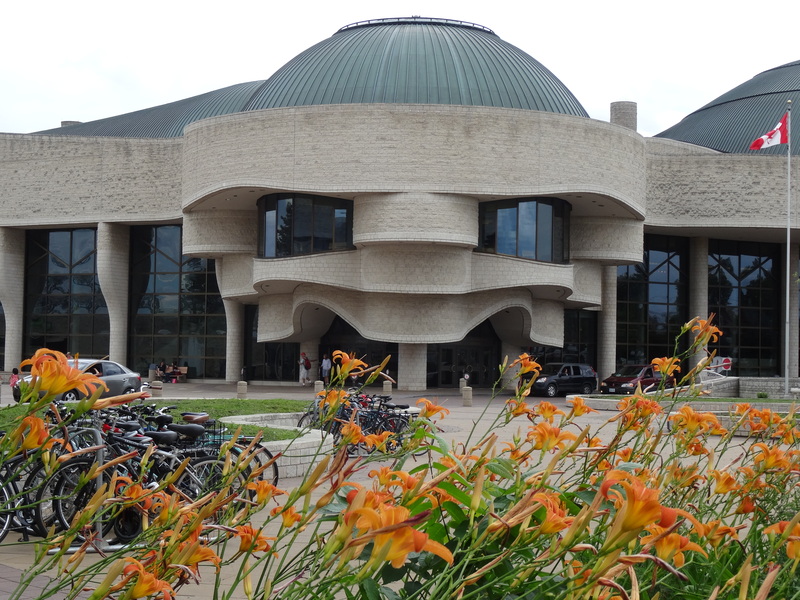 The Canadian Museum of History is located just north of downtown Ottawa and across the Ottawa River in Gatineau, Quebec. We enjoyed their collection of Northern Pacific totems, but were most impressed by the building itself. 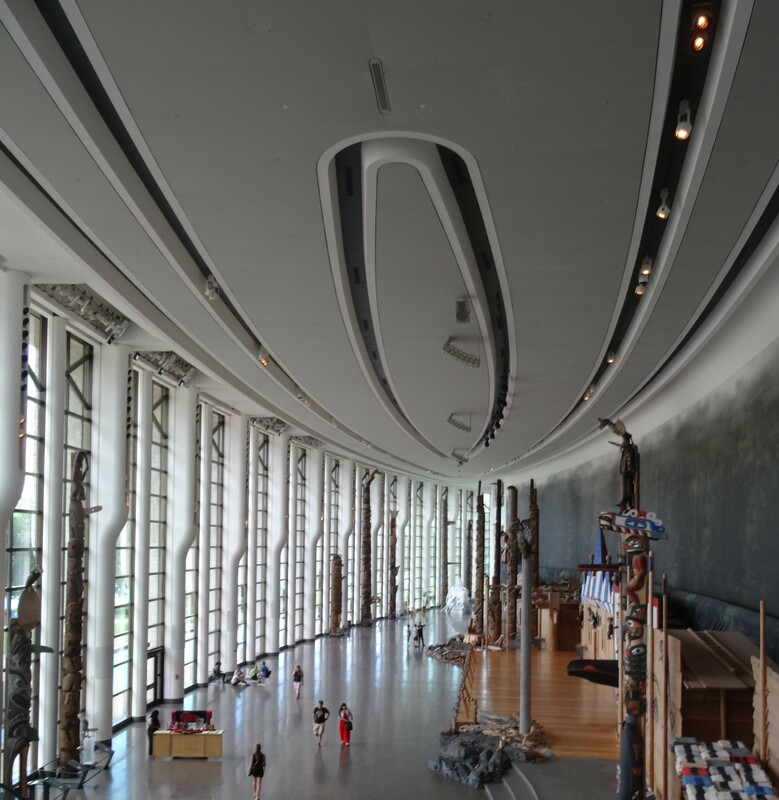 The museum’s architecture very appropriately reflects the art and culture of Canada’s first nation people. To simply walk around the building and its grounds is a great experience in itself. It was not surprising to find that the architect, Douglas Cardinal, is Blackfoot. He was also an architect for the National Museum of the American Indian in Washington, D.C. and is a University of Texas at Austin graduate. From the history museum we walked across the Alexandra Bridge back into Ontario to explore the arts area by foot. We discovered that the gorgeous silver twin steeples that we could see from the north river bank was another Catholic basilica [see Montreal]. 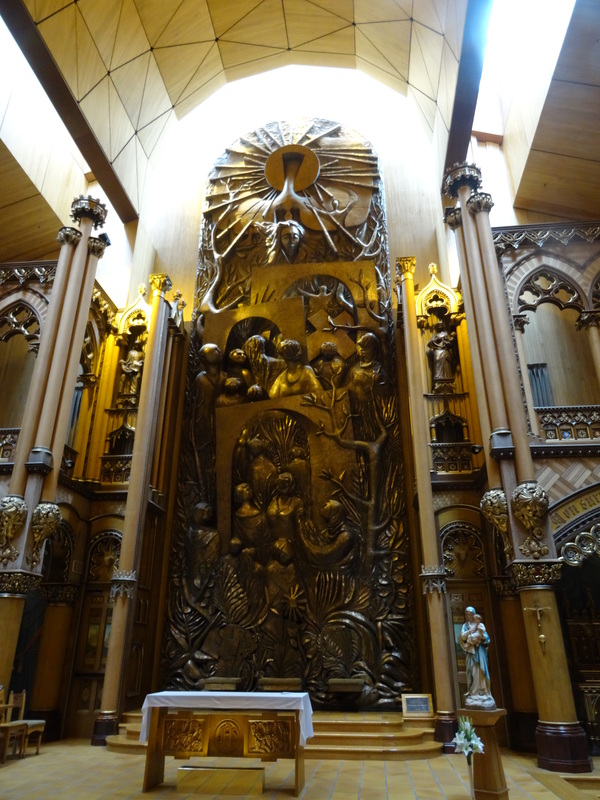 With our new fascination in these special Catholic churches, we just had to check it out. 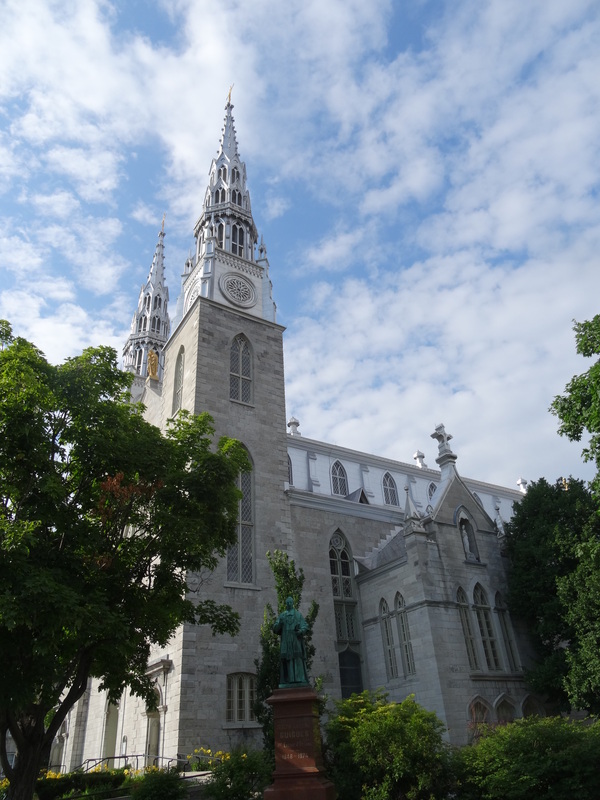 The Notre-Dame Cathedral Basilica was smaller and more humble than Montreal’s basilica, but certainly did not lack in beauty. 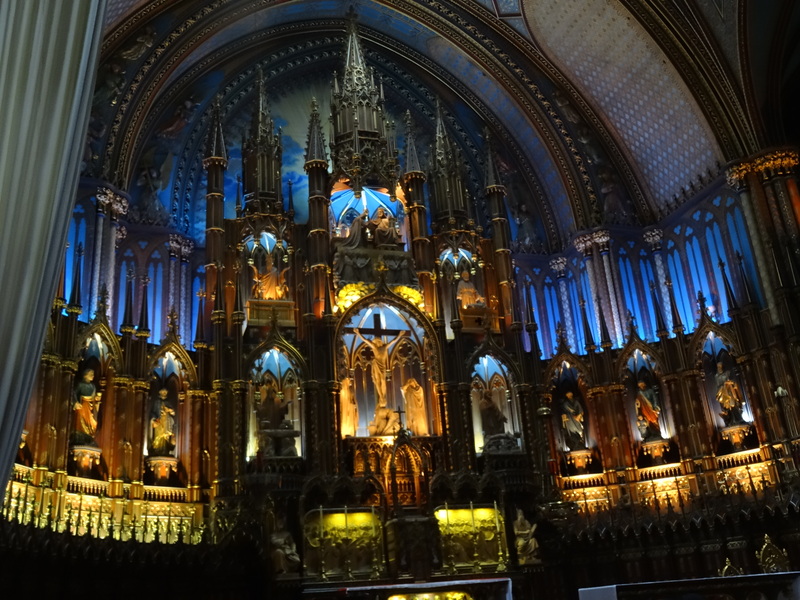 The sanctuary had a deep blue ceiling that appeared to be sparkling with stars, and it had a more peaceful and sacred feel to it than Montreal’s Notre-Dame Basilica – probably due to the absence non-stop guided tours and tourists with cameras. 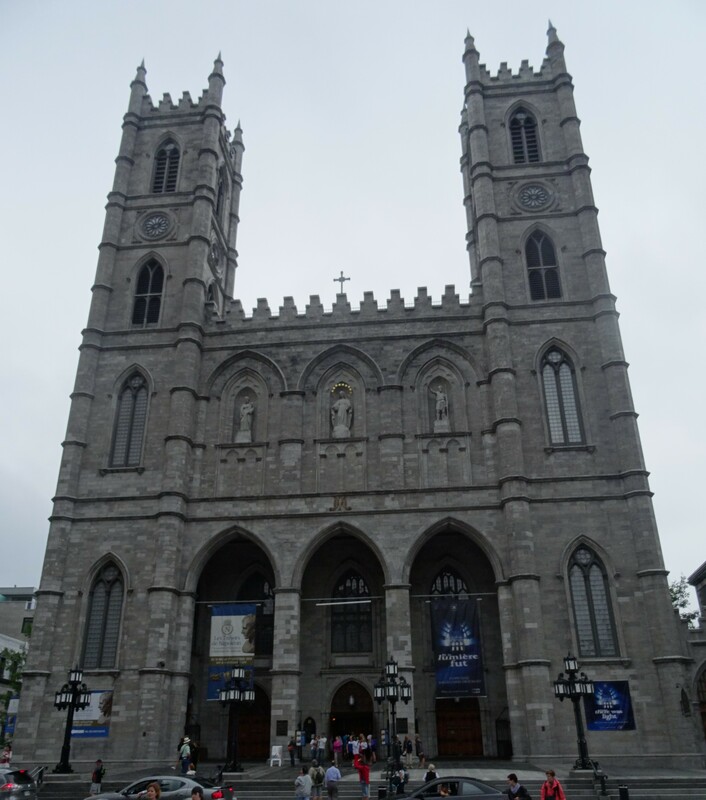 The basilica is located across the street from Canada’s National Gallery – a previously planned “must see” since we’d missed Montreal’s Museum of Fine Art. 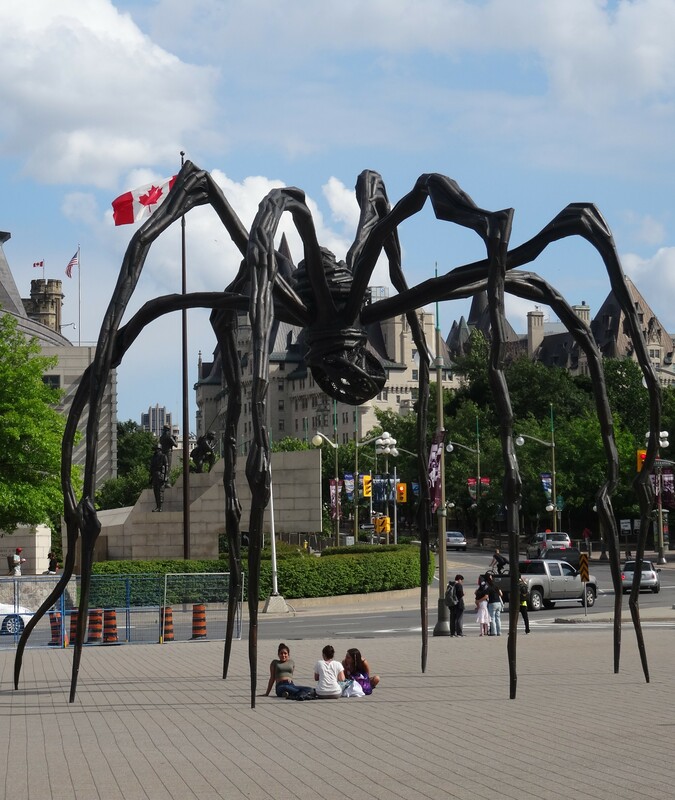 A giant spider sculpture that sits on the gallery’s grounds greeted us on our walk and conjured up comparisons to the creatures in War of the Worlds that scooped up people into holding sacs underneath their bellies. 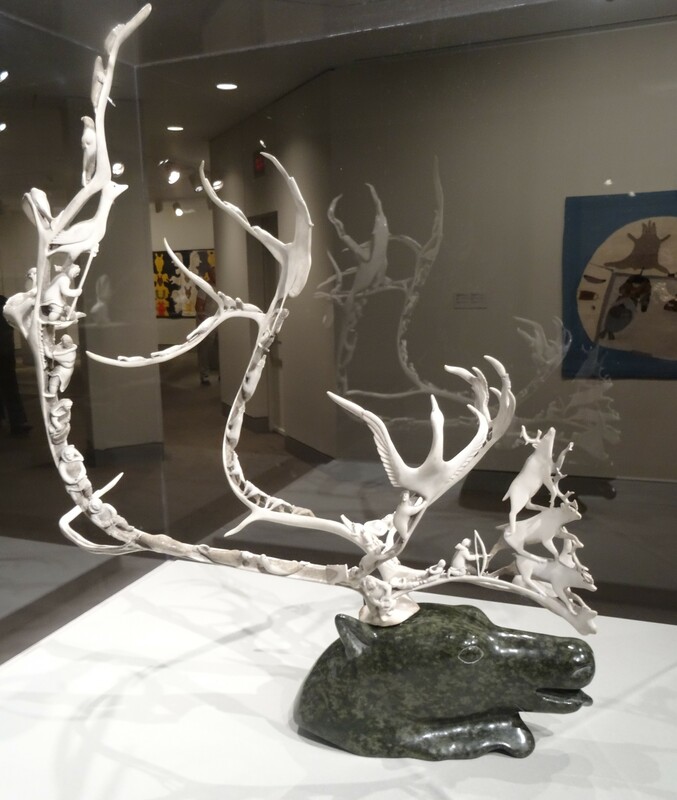 Inside, the gallery has a wonderful collection of indigenous art, many masters and contemporary works. 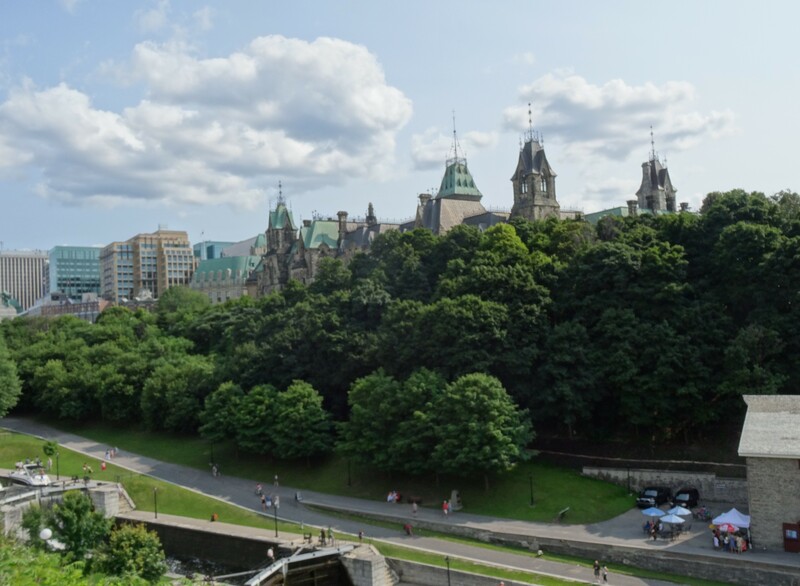 The Rideau Canal intersects Ottawa between downtown and Parliament Hill. 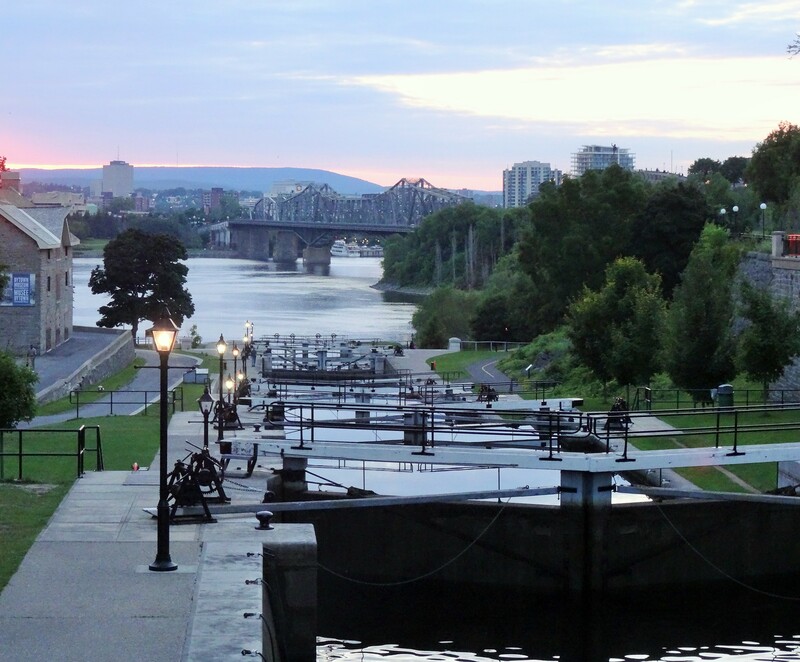 It connects the Ottawa and Rideau rivers, and has been in continuous operation since 1832, making it North America’s oldest operating canal. 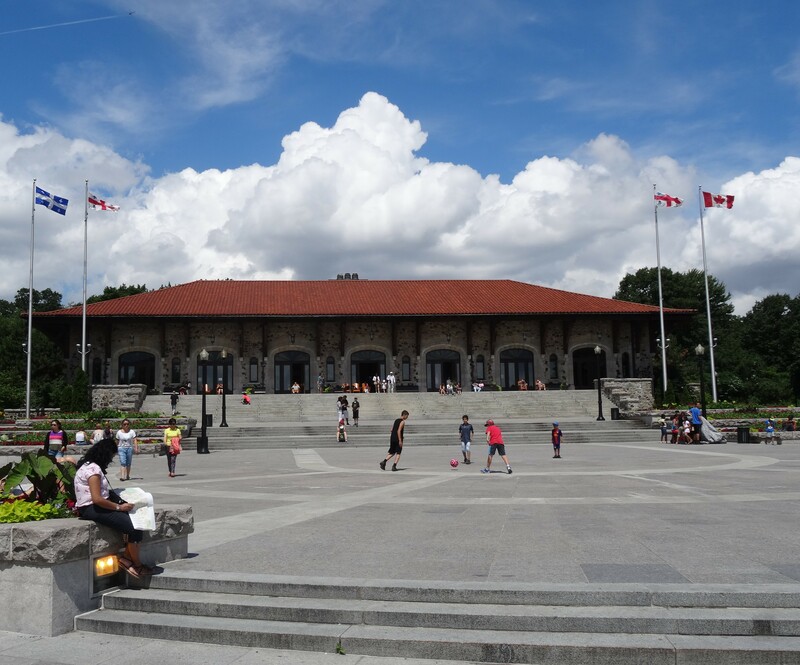 It was built following the War of 1812 to open an alternative supply route from Montreal, Quebec to Kingston, Ontario in case the pesky Americans decided to invade Canada again. 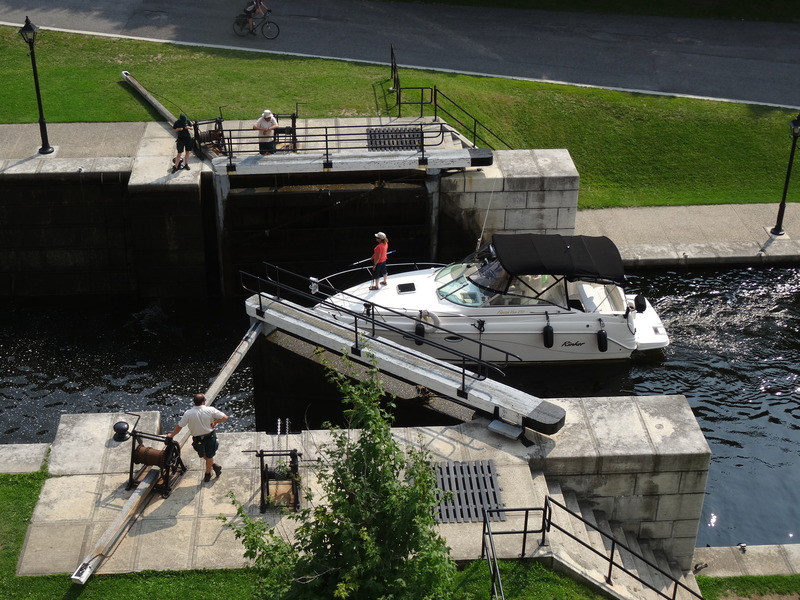 Each time we were in the area of the canal we couldn’t help becoming captivated with the slow process of moving boats through the hand operated locks. 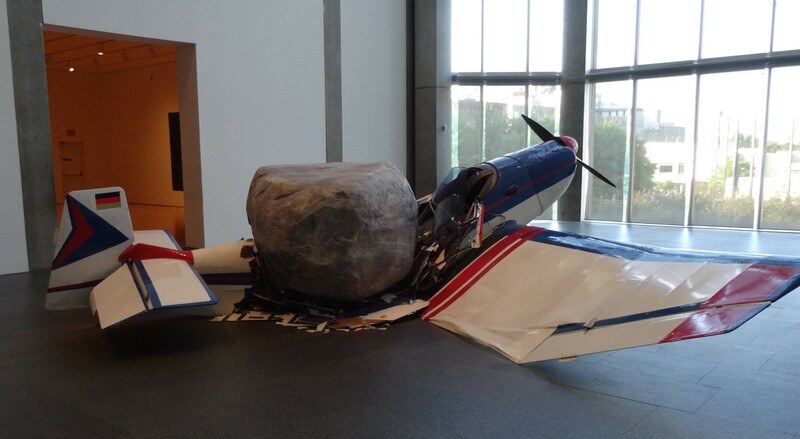 The 21st century crafts were dependent upon 19th century engineering – a very entertaining juxtaposition of time and technology. We happened upon Sparks Street while trying to locate the source of a reverberating salsa beat after emerging from a public parking garage near Parliament Hill. 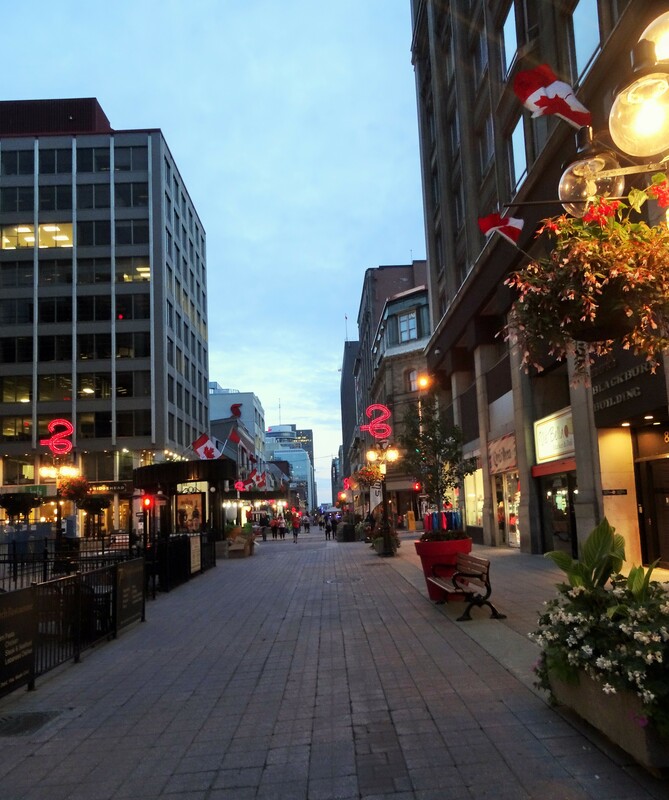 Four blocks of Sparks Street are permanently closed to car traffic and lined with sidewalk cafes and boutiques. 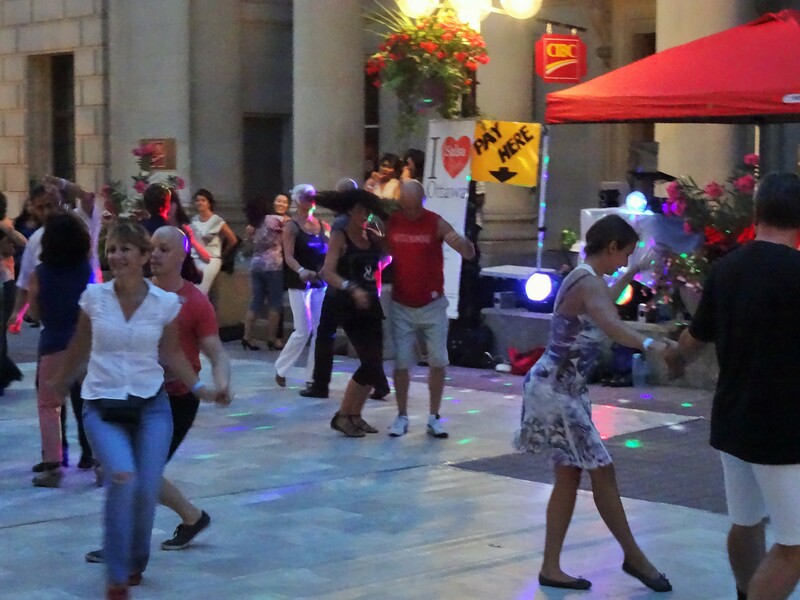 There was literally dancing in the streets and all were invited to join in the fun! Intimidated by the salsa skills we were witnessing, we opted to just watch. L’Ange Café sat directly adjacent to the “dance floor” and allowed us to continue enjoying the music and dancing while sipping cappuccinos and sharing a crème brulee. I picked up a pamphlet promoting a local Shakespearean group, A Company of Fools, at a coffee house across the street from where we were staying. A quick Google search revealed that their next performance was on our last evening in Ottawa at a nearby park. The “fools” version of As You Like It was funny, entertaining and downright delightful. I simply loved Ottawa. I loved its pace, its people, its culture and fun spirit! I’m hopeful to return there someday. 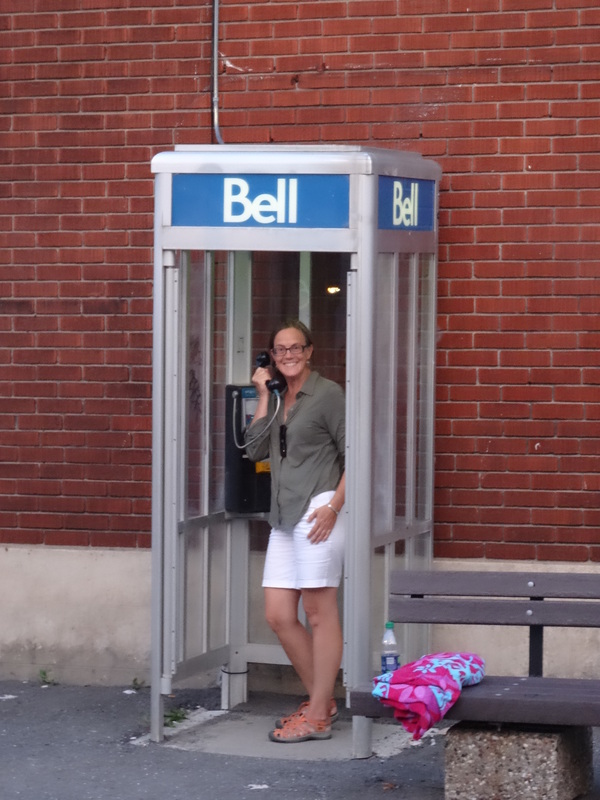 It’s a good thing Ottawa still had phone booths since we had no cell service! Neither Trey nor I had stepped foot outside of the United States until Sunday, July 13, 2014. We acknowledge that Canada can barely be classified as international travel, but that is how it worked out for us – plus, we accept the fact that Canada is a good baby step to acquainting ourselves with foreign travel prior to our planned travel across the Atlantic in the spring. Verizon Wireless knew exactly when we crossed the border and started blasting our phones with texts on the limits of our plan, data service costs, and the fact that we no longer had mobile service. Regardless, we managed to successfully navigate the kilometers to our Airbnb apartment situated between the Quartier des Spectacles and Quartier Latin areas of Montreal. 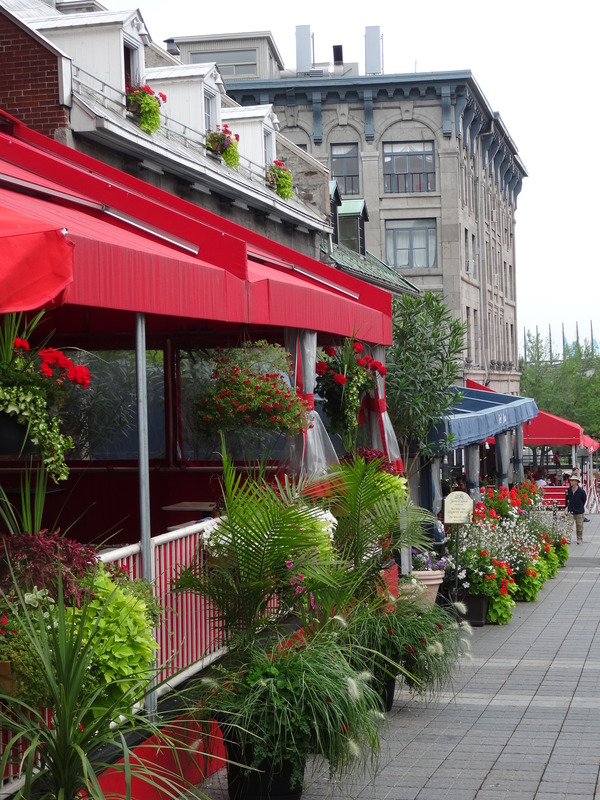 A great location to walk or bike to everything we wanted to see in Montreal! 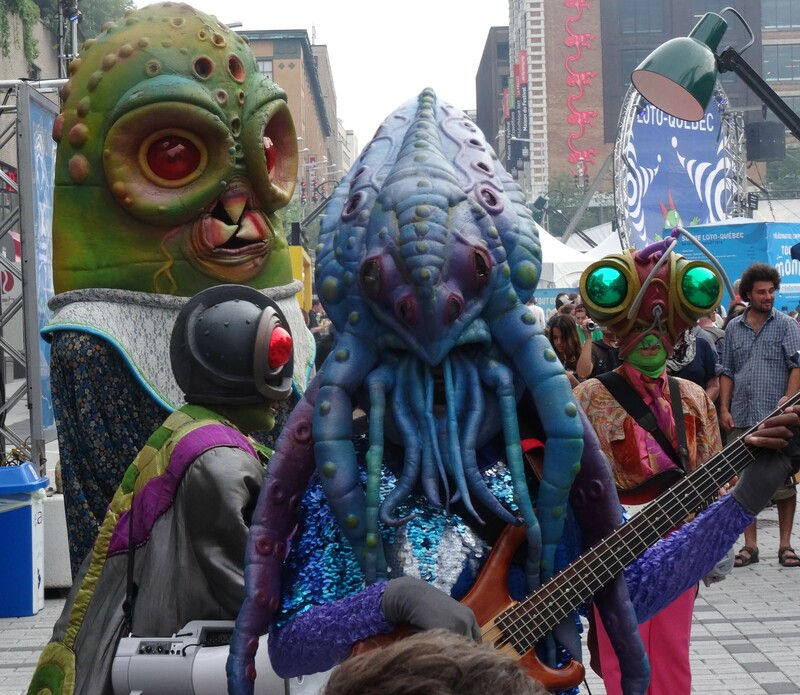 We unloaded quickly as we were anxious to check out a nearby festival we noticed on our trip into the city. We walked just a few short blocks south and then east and came upon barricaded streets, rows upon rows of tents, and loads of people of all sorts. 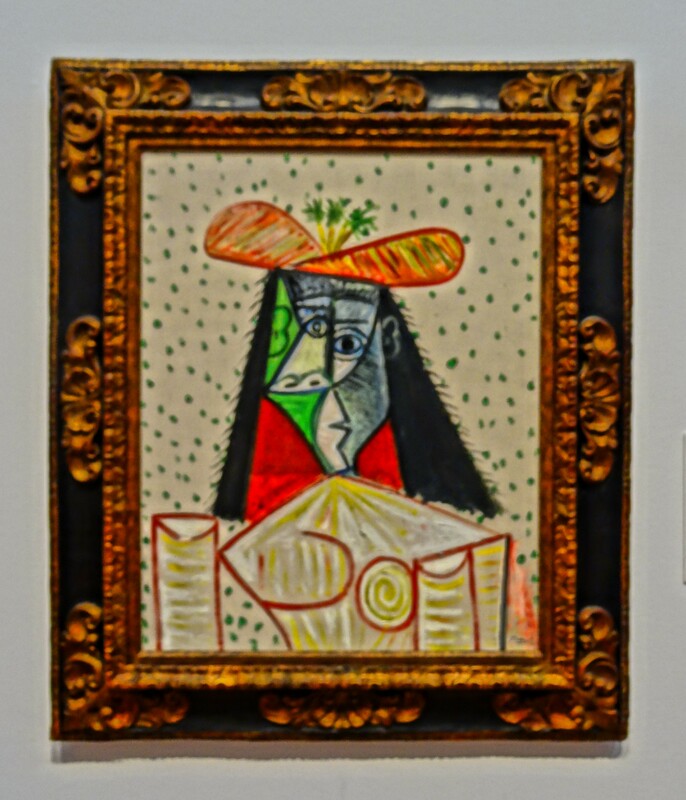 Most like us, spectators, but many that would put Austin’s weirdness to shame – like the little person, a male, wearing nothing but a white cowboy hat, matching boots and a cloth diaper! 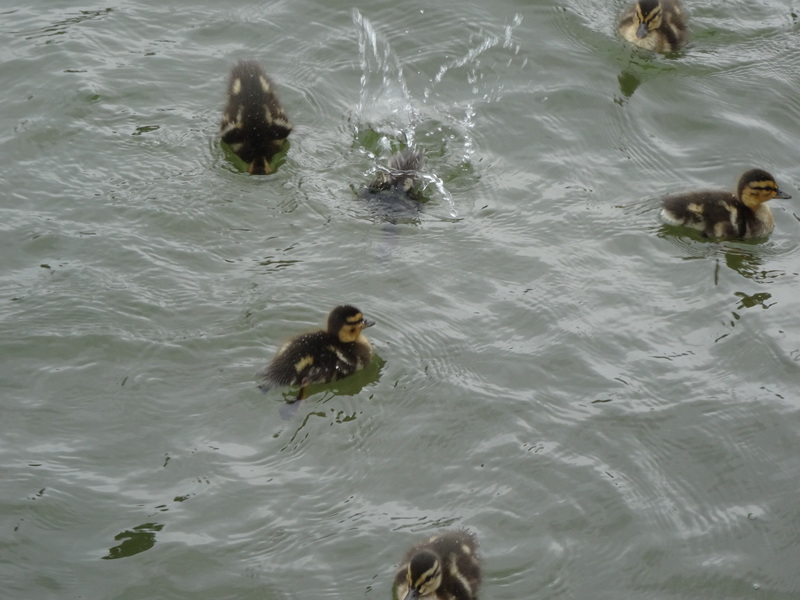 We soon realized he and the others were performance artists. 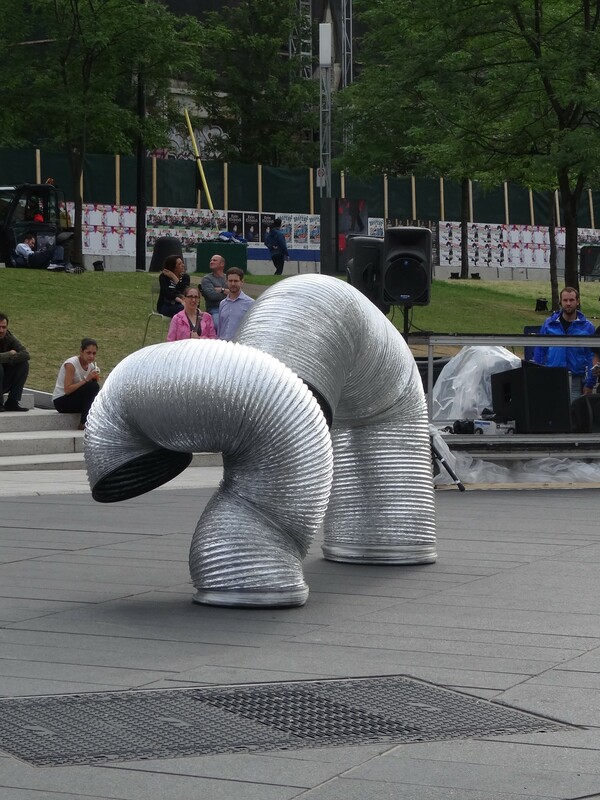 We were enchanted watching a pair of what appeared to be large air conditioner ducts dancing to techno. It was a fantastic welcome to Montreal which made us feel comfortable and at home despite the fact that everyone was talking French. Without cell phones to guide us to restaurants and unable to confidently read menus we were completely reliant on intuition to find a place to eat. We were hungry, but not feeling too adventurous, so selected what appeared to be a chain that had a name we could read – Baton Rouge. It was similar to the U.S.’s TGIF chain in food quality and ambiance, but we were able to refuel and watch Germany beat Argentina in extra time to win the FIFA World Cup. Feeling refreshed the next morning we hopped on our bikes and peddled our way toward Mount Royal. 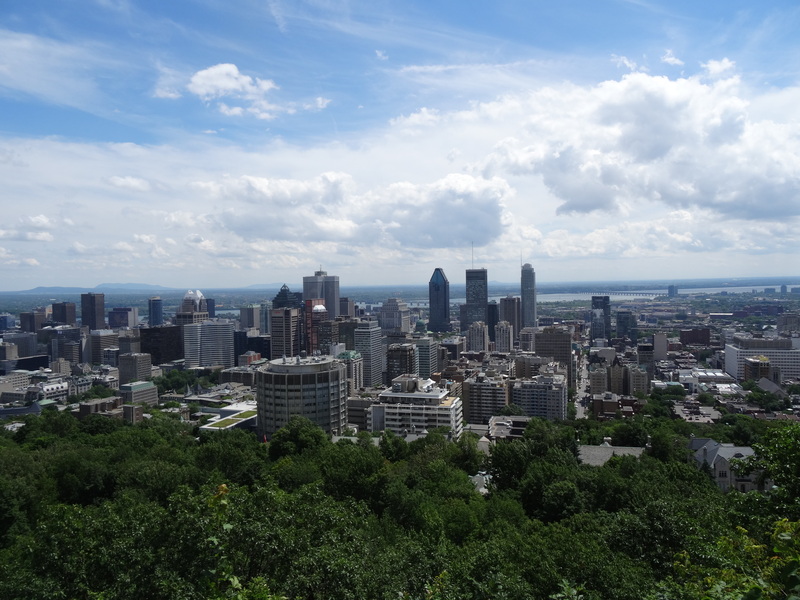 A hill located in the center of relatively flat Montreal and just west of downtown. 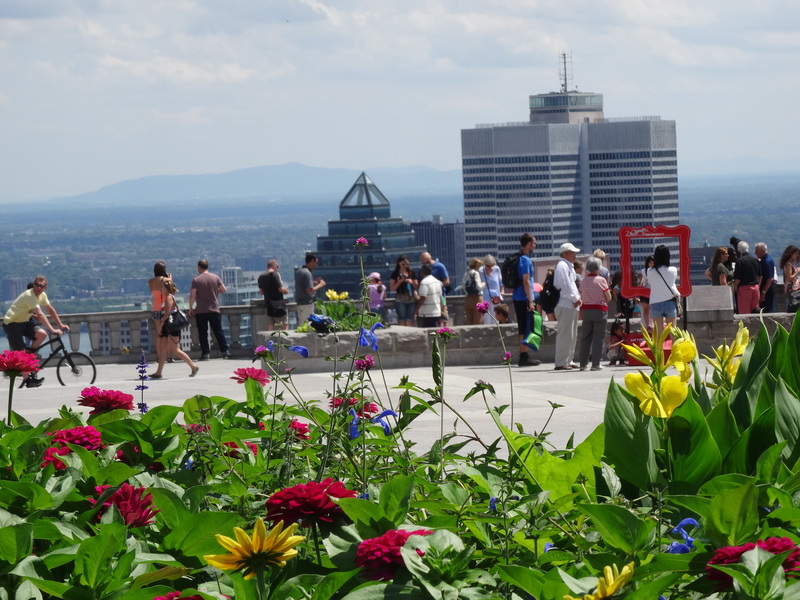 It rises roughly 740 feet above the city and is visible from many parts of the city — the entire city is visible from atop Mount Royal! A city park, as well as nature and recreation areas encompass the hill. It also makes for a beautiful and challenging bike ride. The foot and bike only path is an old carriage road that winds around the hill for about 4 miles ascending at a steady grade to the summit. It was only from the top of Mount Royal that we could truly appreciate the beauty of Montreal. It is an obvious must see for visitors, but it was also an obvious favorite of the locals as well. Having gained some confidence with our ability to communicate with the locals we ventured to find a neighborhood lunch spot near Mount Royal and wound up at Café Santropol – mostly vegetarian and very funky. Perfect! 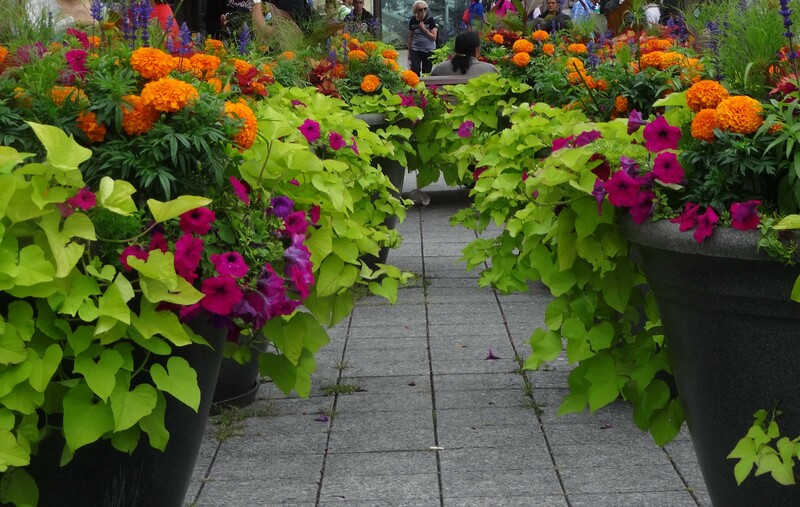 Next, it was off to Jean-Talon market, which we had been told is the best of the city’s several outdoor farmers markets. Had we researched previously, we would have found that it was the further of three in our area and the main route required a harrowing bike ride on a heavily traveled street. 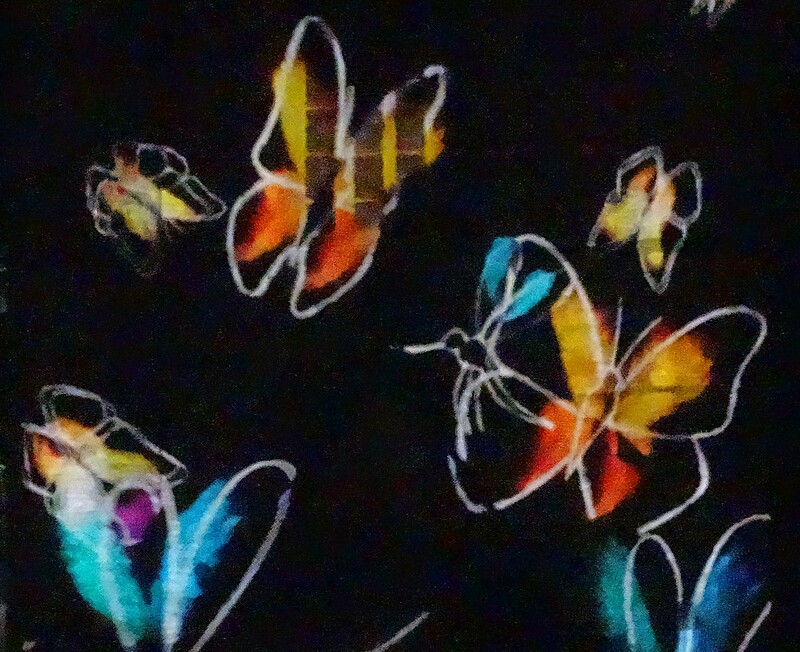 Once we safely arrived though, we very much enjoyed the market’s energy, colors and freshness. The indoor and outdoor market takes up two square blocks and is surrounded by eateries. 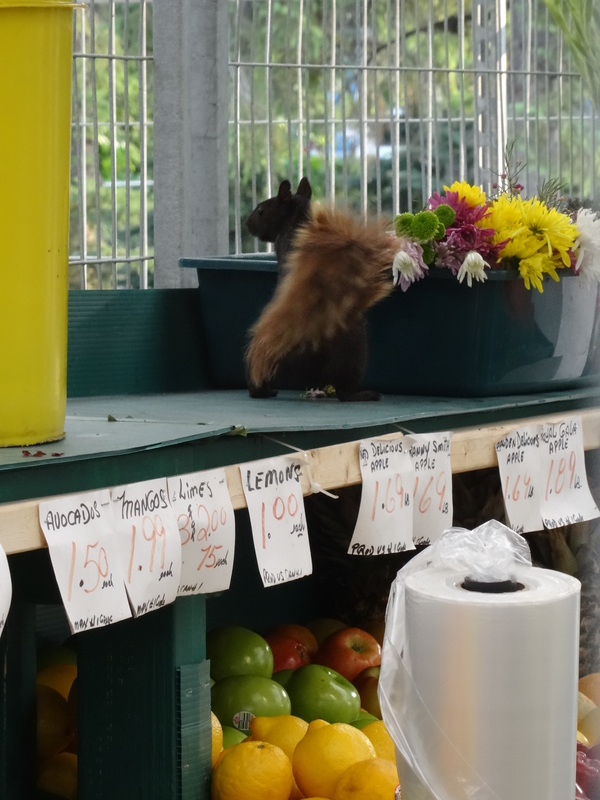 It is well worth a visit even to just browse among the fresh food and flowers. 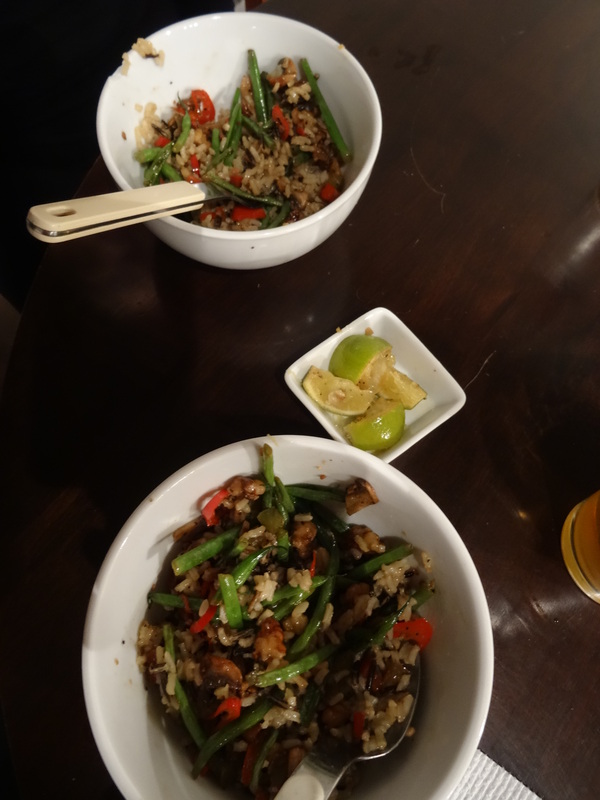 Even though we were on bikes, we couldn’t resist buying a few fresh vegetables which Trey stir fried us up for dinner the next evening. We found an indirect but safer route back to our apartment cutting through neighborhoods and for a portion, an actual bike path. Too tired at that point to cook, we opted to walk several blocks north to Rue Saint-Denis – a lively street lined with restaurants, street musicians, hungry tourists and more than a handful of homeless 20-somethings. Without a particular craving we strolled several blocks before our indecisiveness was overcome by our hunger and we settled on a Mexican food restaurant. Mexican food in Quebec? I know, but it had been over 6 weeks since we’d left Austin and our two Tex-mex meals a week habit. 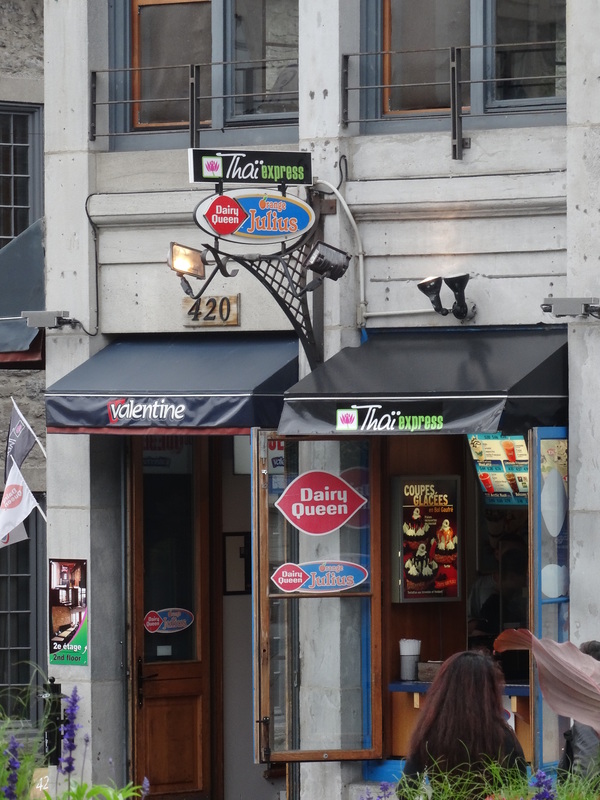 Plus, the sign on the restaurants entrance advertised the best margarita’s Montreal. Sold! The walk back to our apartment at dusk provided us with the most disturbing image we had experienced to date on our travels. I can now say that it was the most disturbing image of our North American travel period. An older than the average Rue Saint-Denis homeless man followed us for a couple of blocks talking sporadically and incoherently. As we neared an open green space I noticed a young woman with light brown hair sitting on the lawn to our left with her backpack contents spread about her. She had some type of makeshift tourniquet tied around her right upper arm and a syringe in her left hand – she was shooting up. This site also caught the attention of the homeless man who promptly turned away from us and made a beeline to this young lady. I wanted to intervene and tell her that she didn’t have to live like that. But very much feeling my own vulnerability in that moment, I instead opted to continue walking with Trey toward our apartment. The well-being of this young lady and our reaction to the scene still haunt me today. 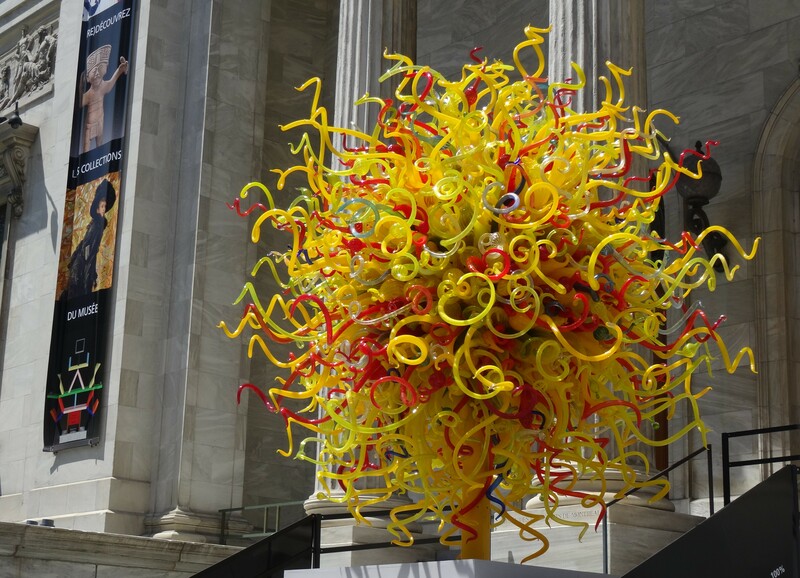 Our last full day in Montreal was just that – a full day. 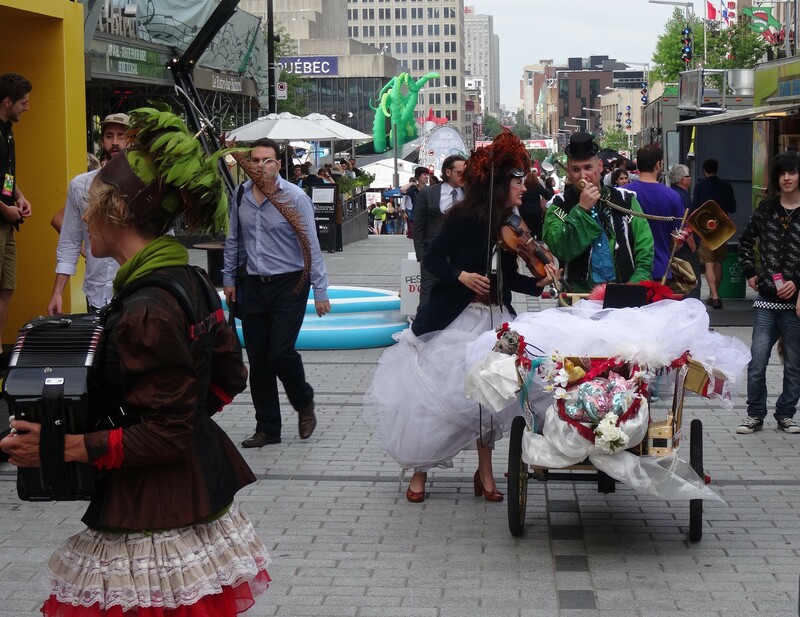 We walked again through the festivals of the Quartier des Spectacles on our way to the Basilique Notre-Dame de Montréal — the first of four basilicas we ended up visiting in North America. We’re not Catholic, nor particularly religious. 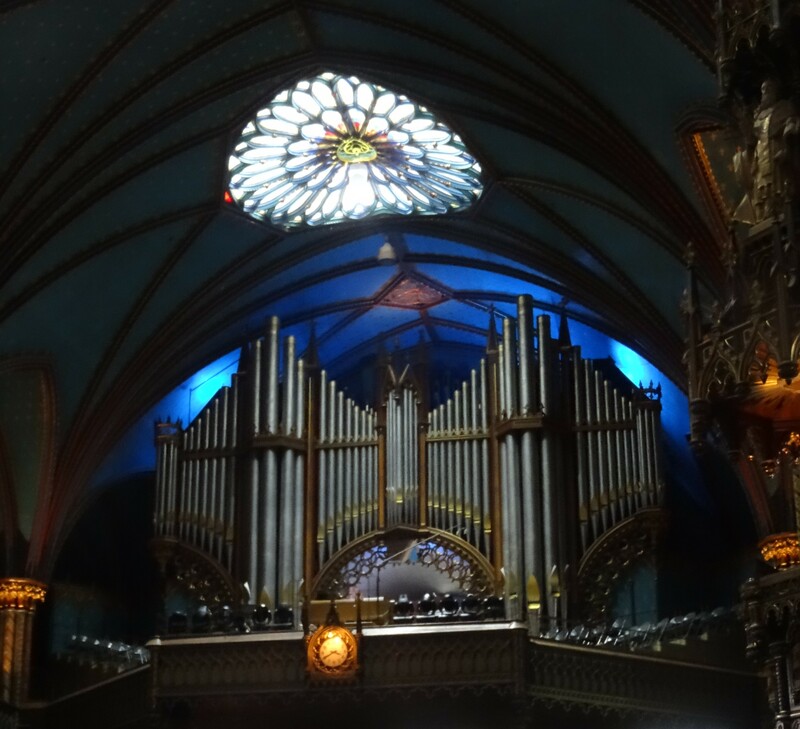 We were simply drawn to Montreal’s Notre-Dame Basilica’s grand gothic architecture; however, it was the opulent interior that left us awestruck and wanting to learn more about what exactly sets basilicas apart from other Catholic cathedrals and churches. The designation of a church as a basilica can only be made by the Pope and it generally is due to the cathedral’s level of historical or artistic significance, and/or its importance or role in the local community. 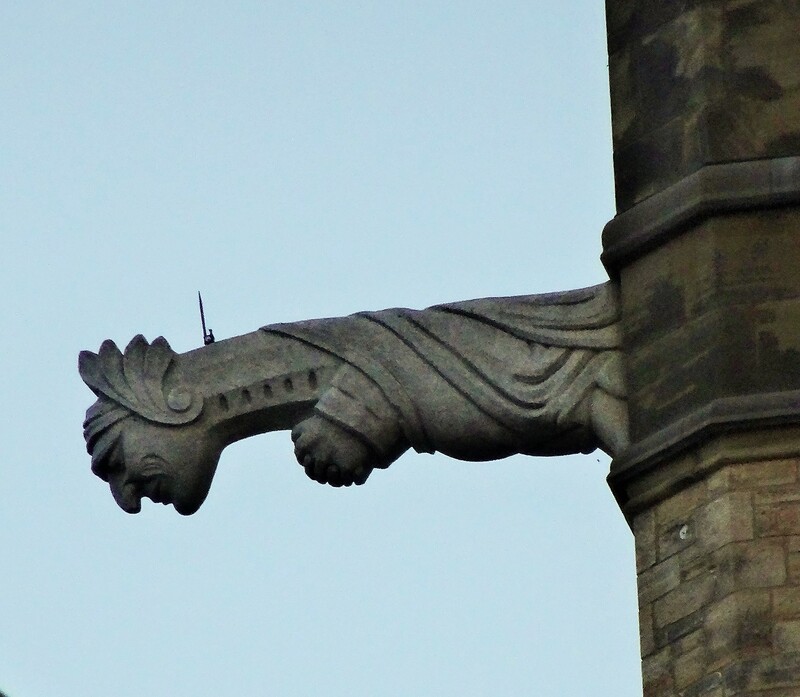 Montreal’s basilica did not seem to be lacking of any such credentials. The massive organ has an impressive 7,000 pipes and four keyboards, and the alter showpiece was a whopping 20-ton bronze sculpture. We were two of about 30 that paid $5 to take one of two guided tours that are offered daily every 30 minutes — The 190 year old gothic revival cathedral was bustling, beautiful and bodacious. My new belief that perhaps the Catholic Church believed there was a direct correlation to the level of grandiose-ness and Godliness would gladly be adjusted later in our trip. It is a short walk from the Basilica to Rue Saint Paul — a street in an upscale residential, shopping, art and dining area that includes several blocks closed off to cars. 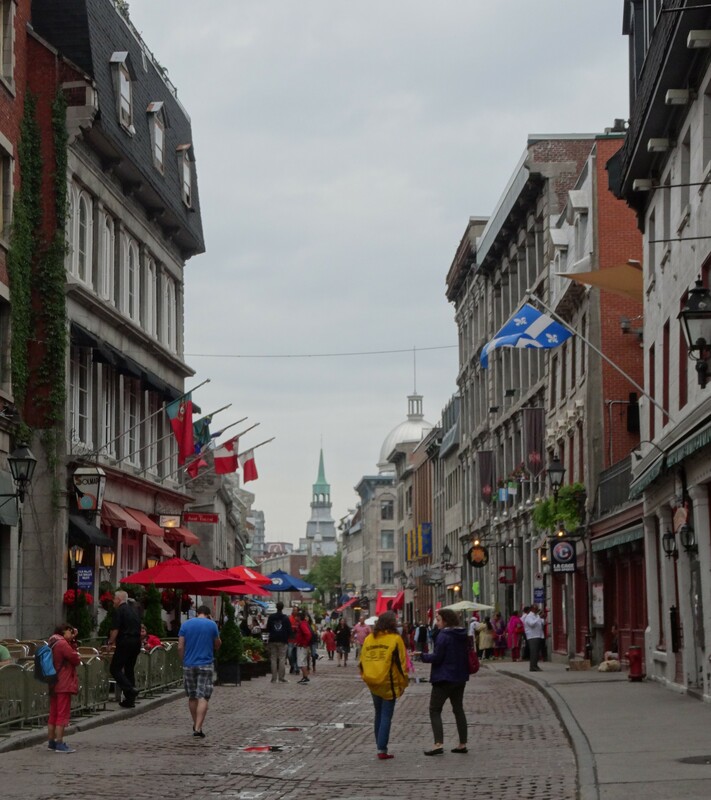 It is located in “old Montreal” which had been surrounded by a wall in the 1700’s and sits along the Saint Lawrence River. I was sorry that we did not allow ourselves more time to explore and absorb the old city. It provided our first experience of what I imagine some European cities will be like – narrow cobble stone streets lined with quaint Victorian buildings full of unique shops and engaging people. 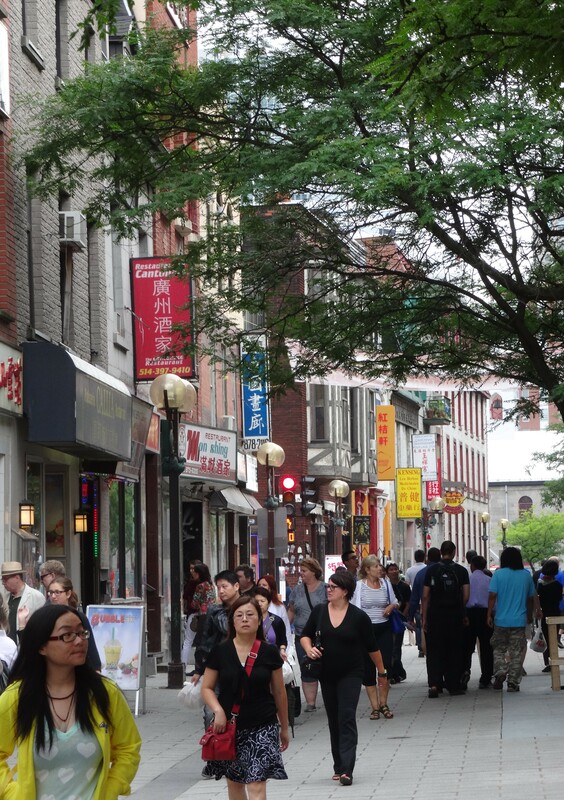 After arriving too late at the Montreal Science Museum to secure entrance, we started the mile and half trek back to our apartment enjoying the scenes and scents in China Town along the way. 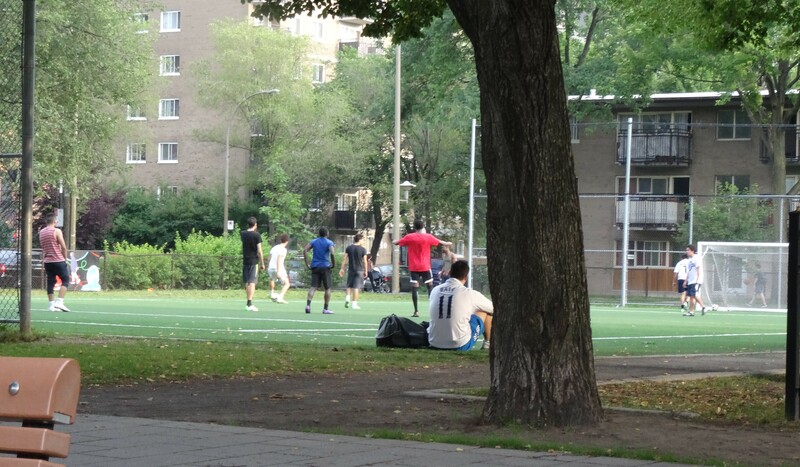 We were happy to give our sore feet a break when we came upon a spirited pick-up soccer match – very competitive and entertaining. 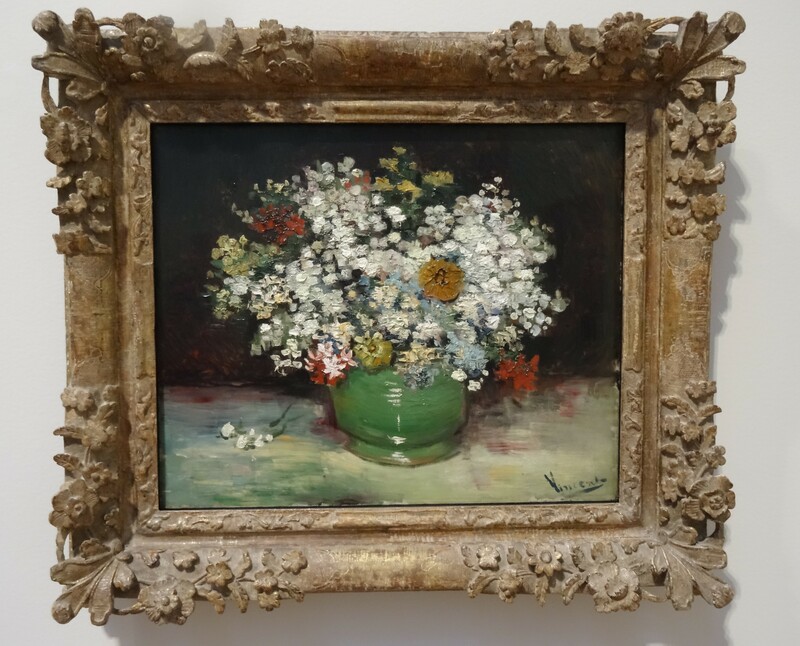 We left Montreal enriched with the experience and people we encountered there, and with a few regrets – again, would have loved to have had more time in “old Montreal,” and will assure that time is allowed on our next visit to tour the Montreal Museum of Fine Arts.